Mayhem Miller promises no "Bully Beatdown" antics at the TUF 14, but it will not be an "all work and no play" season either. 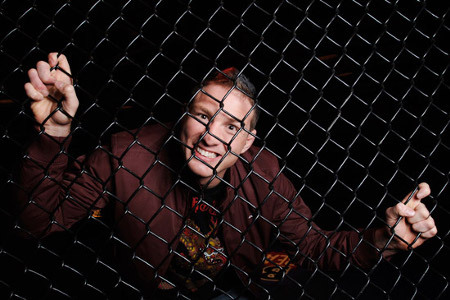 It goes without saying that Jayson “Mayhem” Miller is a high-energy personality who is capable of capturing an audience the moment he peeks his head out of the backstage — or the moment he appears on your TV screen at MTV’s “Bully Beatdown.” However, he insists that his priority as a coach on the soon-to-debut The Ultimate Fighter season 14 is fulfilling his duties. While Mayhem Miller admits that it will not be all work and no play, he knew that coaching opposite Michael Bisping has a potential to stir the spot. But despite hoping for a successful TUF 14 run, both of them cleared out that they did not ham it up for the cameras. And since tension between the two of them seems inevitable, Jayson “Mayhem” Miller believes that the real draw to the TUF 14 is the quality of the fights. That said, The Ultimate Fighter season 14’s debut on September 21 will be a two-hour special; and will feature all 16 elimination bouts. UFC President, Dana White, the coaches and Spike TV personnel are also promising an entertaining farewell to the longtime partnership of the promotion and the cable channel. With Mayhem Miller and Michael Bisping at the helm, the potential for coaching fireworks seems certain. However, the former said that there will be no “Bully Beatdown” antics. TUF 14 will be all about friendly competition, and pushing their respective team members towards success. And ultimately, it will culminate a very real fight between the coaches this December.